See this Landscaping your Life post on how to use the leap to solve a problem in your life today. Would you know what the words "Trust and Respect each other" meant? 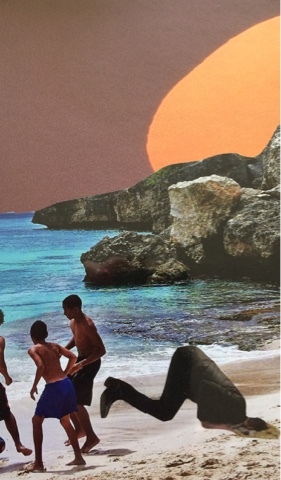 Would this image cover it, or would another image come to mind? 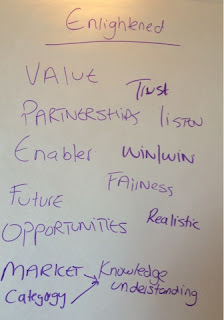 "Trust and respect each other" was one of Tesco's values I shared in yesterday's blog about business values. I don't share it here to reflect on their values - it's just such a great example of how we use words and believe it's clear what we mean. Let's work backwards on the value to explain what I mean. Do they mean just between Tesco employees? Where trust and respect go out of the window for shareholders, suppliers and customers? Or do they include customers in the mix, but perhaps exclude suppliers? Yesterday I shared Ben & Jerry's values and it was much clearer from the language they used that trust and respect would include: "suppliers, employees, farmers, franchisees, customers, and neighbors" because they've been explicitly stated. Do you get a sense of how easy it is for misunderstandings to arise. After all I can hear the person who developed Tesco's values shouting "Of course it just means x - why would it mean y?" The next 2 words in the statement are nominalisations, and not verbs. Each person reading this will, therefore, have a different definition about what the word means. The degree of energy you put into even discussing their meaning will depend on where they appear on your own hierarchy of values. One or many of these, or other examples, may apply for there to be a lack of respect in the eyes of the beholder. Even if the other person has a 'reason' for their behaviour that is, in their opinion, justified, and certainly NOT a sign of disrespect, and would be mortified if anyone suggested they were showing a lack of respect. Difficult to ensure then that when using such words in values statements that there's a clear agreement by everyone about what behaviours are expected. Yes many values statements have a list of behaviours that aim to show what is meant - I suspect in many cases it wouldn't go to the detail listed above. It's not just values statements though where lack of respect might be mentioned. I'm sure it's something often said in contract and relationship management meetings between buyers/suppliers. Without a clear agreement of what is, and isn't, expected it's very easy I'd suggest to disrespect someone without intending to. Lack of trust will have has the same infinite list of behaviours that some would define lack of trust as being. Each behaviour in their own right an opportunity for disagreement over what is, and isn't required. Is your communication clear, and do misunderstandings arise because of the lack of clarity? A previous post considered the different definitions for honesty. Are business values to blame? Personal values are often the topic for coaching sessions with individuals - mainly because they determine our motivation to do things, how we judge others, and why we get so frustrated with other people's behaviours. 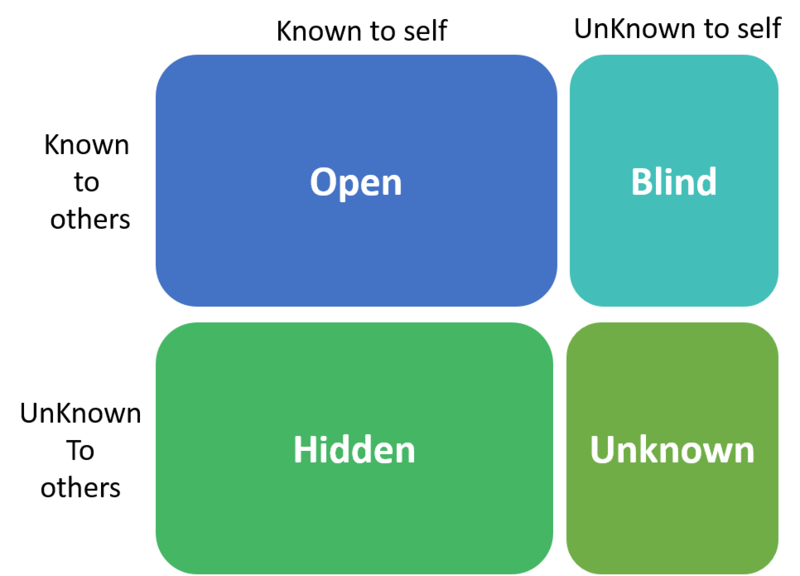 Topics that not unsurprisingly come up frequently in coaching sessions. More here on what those coaching conversations might sound like. That is we are our values - what we stand for is demonstrated in our values, and if you want to know what I will and won't do look at my values, and the behaviours I believe meet these values/criteria. Business values is a topic often discussed but, in my opinion, fails to align with personal values - there's more on why I think business values don't even exist on a previous blog. 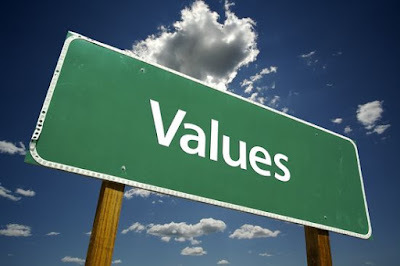 In essence personal values determine why we do everything we do. Every behaviour - every decision - whether positive or negative - is determined by our values. So even the toxic leaders I wrote about earlier this month are doing what they're doing because of their values - or perhaps not just because of their values - but because of what they think they have to do to get their values met. That's what's missing in business values - every behaviour and decision can't be assessed using most organisation's values statements. We can't look at most organisation's value statements and know what they're about because it's missing the fundamental reason organisations exist - to make money for their shareholders. Let's look at Tesco for a moment - who last year were censored by the supermarket watchdog for their treatment of suppliers. The problem is most hard financial business decisions can't be made using these criteria alone? And if they were real values you should be able to - and you'd have a hierarchy telling you their relative importance in relation to each other. That is an organisation could do all of the above and lose money but apparently that's ok because their values are being met, and their core purpose of 'creating value for customers to earn their lifetime loyalty' has been met as a result. It's irrelevant that Tesco might not be there for their lifetime. 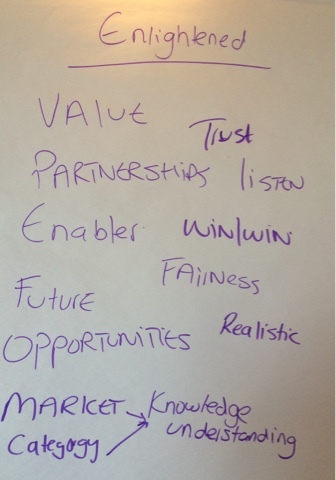 These business values would even question why Tesco even needed to increase payment terms in the first place? Which means there's other decisions that are being made that sit outside this 'warm fluffy' list of behaviours that has no scrutiny, no agreement, and where anything goes, and are likely to be more important than anything that makes it's way onto the values list! And that's the problem with business values - there are decisions being made that sit outside the business values criteria, and as such mean I have no idea what sort of company I'm really dealing with! Yes we could look at Tesco's previous treatment of suppliers and say it contravened 'treat people how we like to be treated' but the original decision to increase payment terms didn't need to use these criteria to obtain agreement. Nothing there about the product they manufacture, the pricing, the customers, the shareholders etc. So lots of great stuff but nothing that tells me who they are as a company, nor why they do what they do and so on. You might not agree with their every decision - especially if you're focussed and appreciated their Be Natural value, and would therefore prefer that it be their only focus - but at least it's honest about the decisions they make, and behaviours you might expect from them. Do your business values provide the criteria for every decision you make, or is unclear how the decisions you make daily fit into the corporate values statement? 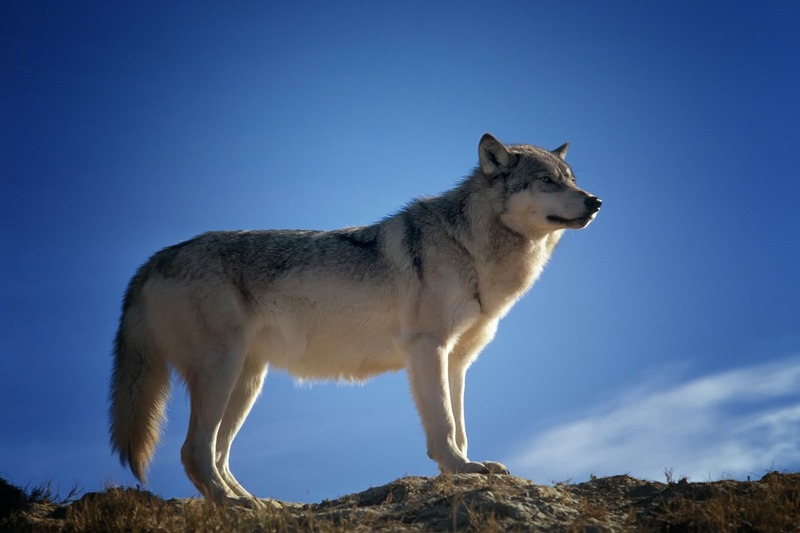 Is Procurement like Mr Wolf or enlightened? 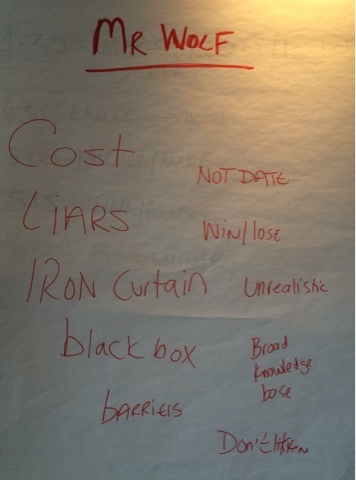 We delivered a workshop last week to an organisation's c-suite more used to selling to procurement than getting involved in procurement itself. What an eye opener, and my advice to any buyer is to do it soon - get in a room full of suppliers (even better your own suppliers), and listen to what they have to say. You might not like hearing what they have to say, but you'll certainly learn a lot as a result! (Ditto for suppliers - find out more about the buyer). Especially when I see myself more angelic - even if more like this warrior angel! Mr wolf lies, is very selfish, doesn't listen, and is only interested in constant price reduction year after year after year after year! Here's the flip charts from the session, they differentiate between the 2 types of procurement these representatives of procurement's suppliers come across. That said they felt they came across Mr Wolf much more often than the enlightened procurement person. Although I soon realised when they said 'cost' they were really only talking about 'price'! In addition to being appalled I also wondered how much the stereotypes we have for buyers and suppliers impact how we act. I'd like to hope that suppliers test the water first to determine which type of procurement they're dealing with rather than make an assumption it's Mr Wolf, and act accordingly. Similarly I'd like to hope that procurement do the same - test the water and determine whether it's a "everyone for themselves" scenario, or a "win/win" situation. In reality though how much testing of the water do you think goes on - for buyer or supplier? Without the testing, and amendment of the strategy to align with the characteristics of the other party, all we can do is fall back on the stereotypes we have for the other party we're entering into battle/communication with. 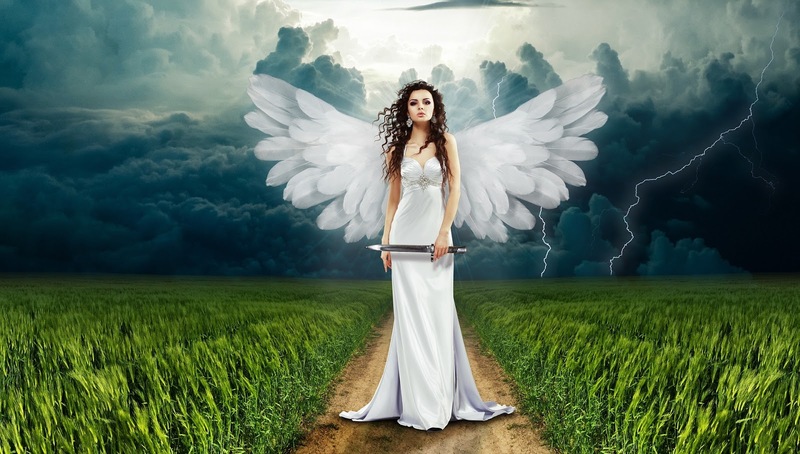 When did you last update your stereotype for buyers or suppliers, and how will that change how you act next time you come face to face with the enemy/ opposition/ partner in crime/ other half/ soul mate? More on this post too challenging suppliers to change the stereotype too. 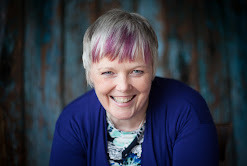 Always happy to help explore how your internal metaphors, beliefs and language may be hindering you from achieving your goals - organisationally, within procurement, or individually. The prevalence of Mr Wolf also points to the lie that soft skills are in the spot light again with CPO's and Procurement. Now that's made me very sad indeed. Does everybody already have great soft skills? 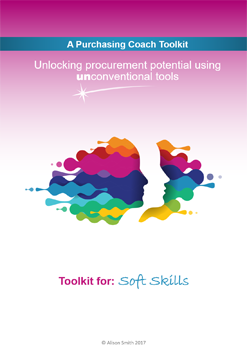 I'd be a rich woman if over the last 30 years I'd been given £1 for every time I'd heard that 'soft skills' are under the spotlight again in procurement, and that CPOs and Procurement realise the benefits soft skills can deliver if done right! Forgive me if I don't believe you this time either! Despite the fact that I'd dearly love to be proved wrong, and have put heart and soul into selling the benefits for the last 16 years. It's not just because suppliers told me last week that most procurement people they meet are like Mr Wolf. Although that certainly reinforced my view. It's not just because KPI's and performance measures still seem to focus on short term price reduction, to the exclusion of other long term value benefits we can deliver. Although they certainly reinforce my view. It's not just because when delivering workshops sharing the soft skills used in category management and supplier management (ie the enablers for getting more value from it) many of those there say "this is all very well but we can't use them in our day to day activities - it's not what the organisation wants us to do." ** Although it certainly reinforces my view. It's not just because CEO's and CFO's continue to run roughshod over procurement strategies and contracts at whim - see my letter to CFO's re ownership of payment terms, and post on why procurement isn't seen as strategic by your board, and post entitled toxic leadership. Although they certainly reinforce my view. It's not just because of all the horror stories accumulating in my Pinterest board - often involving organisations bullying suppliers into reduced prices or increased payment terms. Although they certainly reinforce my view. It's not just because I still get told "but I don't do the soft fluffy stuff" when clearly they're breathing and using criteria to determine what they will, and wont, do every day. Or someone queries whether there's room for kindness in the work we do. Although it certainly reinforces my view. Each in their own way reinforcing the sad reality I'm having to face that very little has changed in 30 years, and soft skills is just a euphemism to do what we've always done - ie to not listen to internal stakeholders or suppliers, and to use the skills instead to support unacceptable business practices in order to get short term gain! It's too easy to take for granted that just because we can talk to other people, and often manage to keep colleagues, managers, internal stakeholders and even suppliers satisfied that we're communicating and influencing well, and therefore using our soft skills effectively. 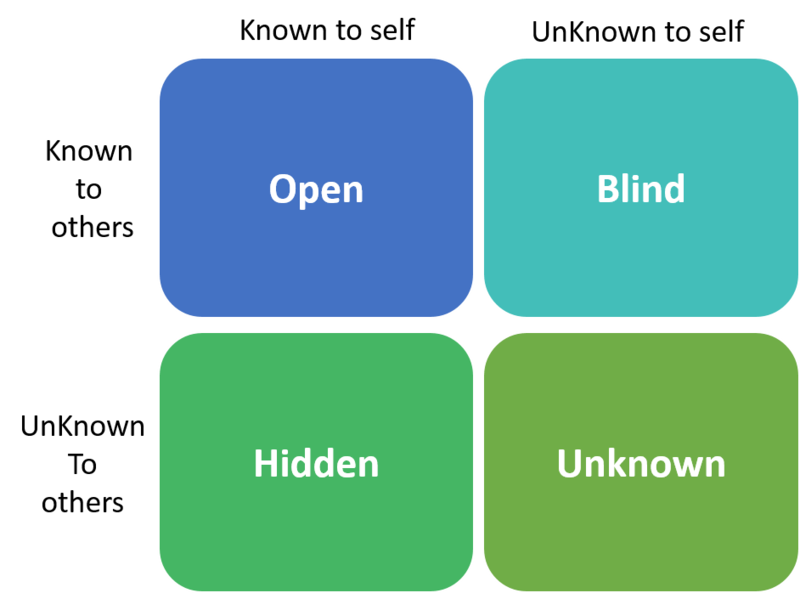 As I said in a post last week, there's many characteristics that are hidden or unknown, and I'm sure many of those relate to our application of soft skills. What are you doing to ensure the continual professional development of your and your teams' soft skills? And ensuring the aspiration we have for procurement becomes a reality rather than it just feeling like another ground hog day. ** I feel the need to say "not all clients" but certainly the larger percentage of those attending workshops. I'm sure your answer to the question "Is your head in the sand" will have been "No." The challenge I'm setting everyone reading this post is to determine what behaviour(s) you have your head in the sand about, and identify how you're going to take your head out of the sand, and take responsibility for the impact of these behaviours. And always there's an "unknown", that may get smaller, but always hidden from everyone. I'd suggest there's another model that aligns with, and confuses this analysis. 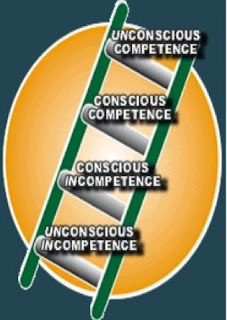 That's because before something is consciously known to us it's unconsciously not known to us - that is we're unconsciously incompetent, and then aim to be consciously competent via conscious incompetence before finishing at unconscious competence (see here for more on this model). If I mix the 2 models - we can believe we know something about ourself but other's know it to be inaccurate. 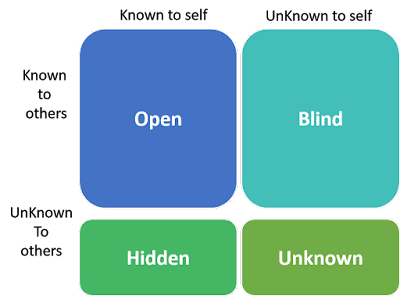 That is I'm unconsciously incompetent about a blind spot, even if I believe myself to be unconsciously competent, and open about it!! So how do we do what today's Osho card invites us to do, and become more aware about all of who we are, and therefore be able to take responsibility for how our behaviours positively, and perhaps more importantly negatively, impact others? 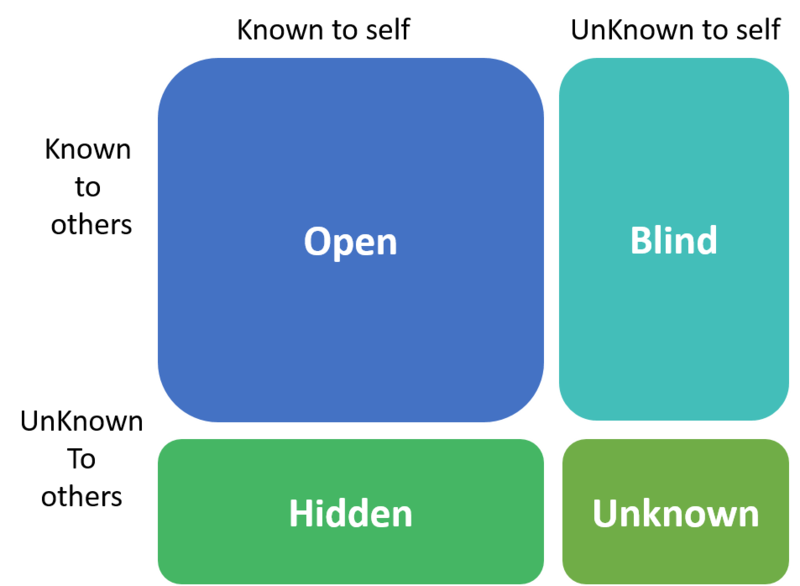 Firstly remembering we're looking for something hidden or unknown by us about ourselves - so common reactions when we start exploring the evidence may be disbelief, denial, anger, or resistance , or even rushing to put your head back in the sand. Learning - this is where the learning ladder above works well with the Johari window - learning or relearning skills can help us understand areas where we were unconsciously incompetent that we didn't know what we didn't know about. It's not an easy problem to solve, and yet if we could solve it I suspect we'd have less Toxic leaders that I wrote about yesterday. The challenge is many of those toxic leaders will be sitting very firmly in the hidden or unknown box above, oblivious to the fact we're talking about them - talking about you? We all think we're different, and that any and all advice provided isn't directed at us - me included. What happens however, if every sentence in this blog was directed at YOU? What happens if there was a behaviour, that you're oblivious to, that's stopping you or the organisation achieving its goals? What happens if there's a behaviour that every minute of every day is taking you further away from you achieving those goals. Wouldn't you want to know about it? Wouldn't you want to do something about it? Imagine for a moment what life could be like if you, and the organisation, could achieve the goals you've set yourselves? 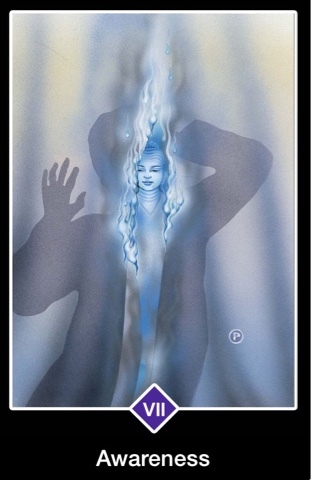 The choice is yours - hunt for the hidden or unknown aspects of yourself, and increase the likelihood of you achieving your goals, or bury your head back in the sand, and keep getting the same results! Hypertext links in the text either take you to blogs I've written on the subject, or to other sources of information about that subject. Toxic leadership isn't something to be proud of - is it? Certainly not when we look at the definition of toxic: poisonous, dangerous, destructive, harmful, malignant, pernicious, deadly! Not something we need in any organisation? Yet many leaders see that heartless and ruthless streak to be a valuable asset to their organisation - and it can be - in a short term, bottom line, profit only sort of a way! I recently attended Let's talk about it - changing attitudes towards our mental health at work. Which sounds about right to me - you? I do wish it were simpler to rid business of such leadership. If it were then we'd be able to say without hesitation that the financial institutions' leadership are less toxic as a result of the crash in 2008? I'm not sure we can? do you? Not really anything that easily fits within our individual areas of influence? We can try, but changing other people is never something that's easy to do - even when we have the authority to try. As I write in "Is your head in the sand" toxic leadership is not something many leaders will self identify with - so you've not got much leverage there either. You only have to look at many of the current, and former, runners for president of the United States of America to realise that power and money, or should that be money and power, are a toxic mix that can get these leaders very far indeed. It's no different in many organisations - although I realise there are exceptions (e.g. B Corporation, Arianna Huffington's Thrive and the third metric, The BTeam's plan B and so on to name but a few). So if the above are not easy solutions you and I can have any influence over - what can we do? Ensure you're not condoning any of the behaviours demonstrated by these toxic leaders - ie stop behaving like these toxic leaders. How can we criticise another for doing so. It's too easy to say the repercussions are greater for those with power, and therefore forgive ourselves our little indiscretions. That then begs the question "where is the line?" - when does someone move from good self interest to bad self interest, or move from acceptable lack of concern for others to unacceptable lack of concern for others? Perhaps in the belief that others can look after themselves, and the impact isn't so great. The problem of course is those bullies grow up. I'm sure the toxic leaders started by thinking the same! Perhaps the answer lies in an earlier blog about stopping playing games at work? Or even in 'is your head in the sand' if you really are one of these toxic leaders, and don't know it! 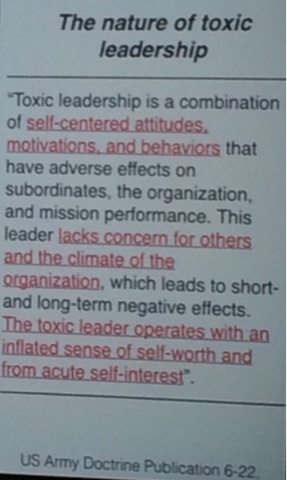 Do you agree with this definition of toxic leadership, and what do you think the solution to toxic leadership is? 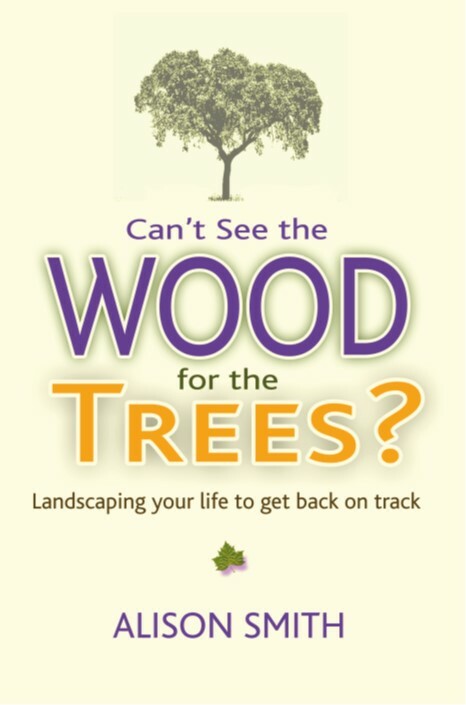 And just to provide a different perspective I used the metaphor of toxic plants in this blog, over on Landscaping Your Life where I use nature to inspire change, to see if a different insight could be gained from a less defensive analysis. I certainly felt less irritated having explored the situation metaphorically - see what you think. 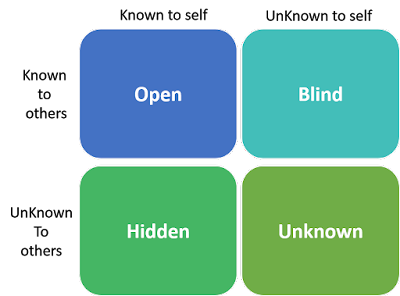 A blog I wrote some time ago was entitled "don't turn a blind eye" and invited us to speak up against toxic behaviours in business. 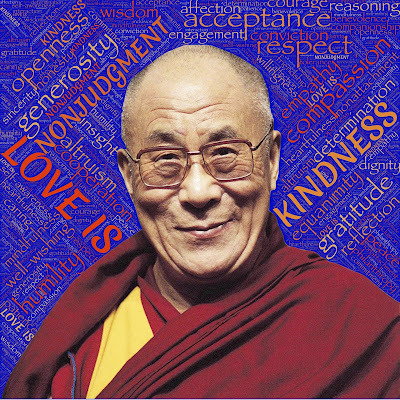 And my blog 'is there room for kindness in procurement' was an invitation to bring your humanity to work every day. How's your supplier's mental health? I recently attended Let's talk about it - changing attitudes towards mental health at work. A conference that reminded us all of the benefit of talking more about mental health. You'll see from the blog the different ways we were being encouraged to speak about mental health. It got me thinking about talking about mental health with suppliers. What should we do less of? What shall we keep doing? 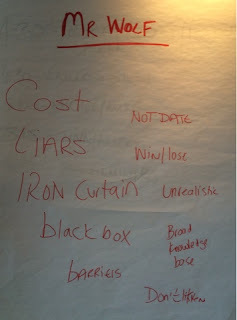 Or shared with them how their behaviours are impacting the mental health of those within the buying organisation. It's so easy to talk in terms of orders, invoices, contract terms, service level agreements, key performance indicators, and forget we're often just human beings dealing with other human beings. Human beings with mental health that can either support their ability to do their job or not! In the blog "But I don't do soft fluffy stuff" I tackled, even if perhaps a little too vociferously, my belief that we're all human beings and not androids. This belief is the reason why I believe procurement has a responsibility for ensuring it doesn't abuse it's power, nor push supplier's to break point. Especially when we hear stories of many people broken due to Tesco's, and other organisations', behaviour with respect to payment. It's too easy I suspect to say "I wouldn't do that! ", and then move onto the next blog, and forget all about the question. I am sure my actions over the years, however unintentional, have negatively impacted others. Should I just think "Tough! I was just doing my job" or "I wonder how I can do this differently now and in the future?" Not an easy quandary to answer - especially when many organisations aren't even talking about, nor considering, the mental health of its own employees - never mind those of other organisations. Are you're supplier's afraid to say no"
and perhaps taking the human/human interaction one stage further, and looking at human/earth interactions with "If the Earth was a supplier"
Do you think it's procurement's responsibility to consider our impact on a supplier's mental health? and they yours? I'd love to know your thoughts - do leave comments below.